New Zealand produces honeydew honey. What is it? 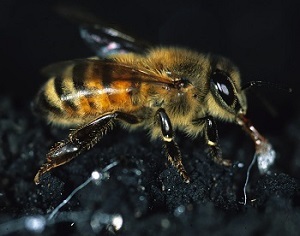 Honey gathered from the flower nectar of honeydew fruit plants? 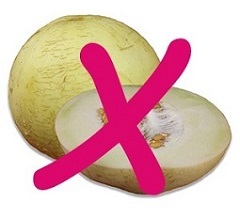 No, it has nothing to do with the honeydew melons we find in our supermarkets every day. Neither are we talking about honey infused with some honeydew melon flavoring or artificial essence. 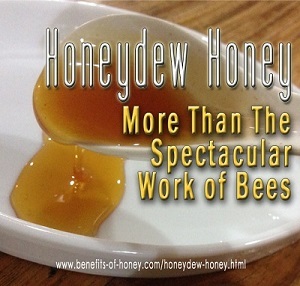 Honeydew honey is known to be one of the most unique, most intriguingly exotic honeys in the world. It has been acclaimed as a special honey even among the specialties. Now a New Zealand's premium export item, honeydew honey is highly prized in Europe but still relatively unknown in Asia. However it is believed that with the increasing number of clinical studies in the recent years, this honey could one day be the next hot health food with a prominent standing just like Manuka honey. I've got honeydew honey sourced from the black beech forests that stretch along the Southern Alps of the South Island, New Zealand. As described in the literature I came across, this amber color honey is delicious. Full-bodied and silky smooth, it has an incrediby distinct and intense aroma of the woods, a malty, earthy flavor and obvious tangy notes. (And in case you are wondering, there isn't the slightlest hint of honeydew fruit scent.) Honeydew honey pairs perfect with cheeses and is an ideal drizzle for salads, desserts and Greek yoghurts. A fabulous honey which I can't wait to share with my guests and one which every honey enthusiast must try! This honey contains a higher antioxidant, antibacterial activity level, mineral content and greater nutritional and therapeutic benefits than most regular flower honey. "Honeydew honey has a higher amino acid composition and disease-fighting antioxidant capacity." ~ Journal of Agricultural and Food Chemistry 2007. "The bioactive compounds content of honeydew honey is very high, comparing to other types of honey. Its antibacterial activity is evidenced by the bacterial growth inhibition for 10 strains of Staphyloccocus aureus." ~ University of Agricultural Sciences and Veterinary Medicine, 2008. "Honeydew honey has differentiated chemical and physicochemical characteristics besides potential functional properties such as antimicrobial, anti-inflammatory and antioxidant...a lower content of monosaccharides and higher values of pH, acidity, electric conductivity, proteins, minerals, phenolic compounds, and oligosaccharides compared to blossom honeys, which contribute to its outstanding biological activities." ~ Department of Food Science and Technology, Federal University of Santa Catarina, Florianopolis, SC, Brazil, 2019. 1. If you are residing in Singapore, check out Bee Healthy's range of honey products. End of "Honeydew Honey - More Than The Spectacular Work of Bees". Back to "Exploring Honey Varieties!"